After consistently lying and changing their stance towards Jamal Khashoggi’s death inside the Saudi embassy in Istanbul, The Saudis have acknowledged what the world knew from day one, that Jamal Khashoggi was killed inside the Saudi Consulate. The reason of death Saudis gave is so absurd and funny that it looks like a B grade Bollywood movie about a typical gangster family killing their enemies and hiding it while the people watch it on Cinema screens. The Saudis said Jamal Khashoggi died after a fist fight broke out between him and the Saudis arrived on two special planes from the Kingdom on the same day, including the most trusted men of the Saudi crown prince Muhammad bin Salman. Khashoggi was not a fit and tough guy who would take on 15 trained guys but even if we believe what the Saudis are saying, there are many questions that needs to be answered. 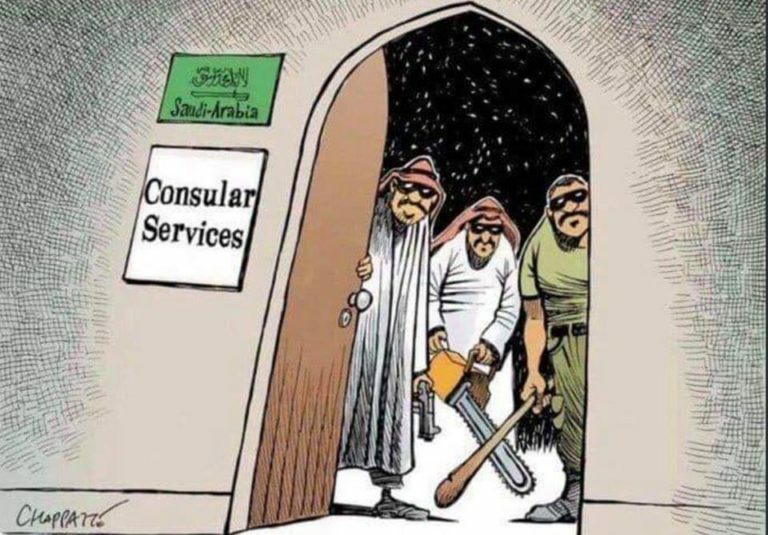 1: What was the reason of the fistfight between Khashoggi and the Saudi assassins at the consulate? 2: Is there any evidence that could lead us to believe that Saudi assassins were there to interrogate him? 3: Where is the ” list of questions ” asked by the Assassins to Jamal? 4: How was he killed and who was responsible for the ” death blow ” ? 5: After he was killed, what happened to his body? 6: Why and Who dismembered his body, under whose orders? 7: Who was responsible for dealing with his body? 8: What happened to the guy who disposed off Khashoggi’s body? 9: How the most trusted men of Muhammad bin Salman can do something like this without his permission? 10: How Gen Assiri, Saudi Qahtani handpicked by Muhammad bin Salman can give it a go ahead without Prince MBS’s nod? 11: What happened to the Forensic expert who according to Media reports have died in an accident after he came back to KSA? 12: Can the Saudis be trusted to investigate Khashoggi’s murder case under MBS, the guy who is directly involved in this case through his most trusted men? 13: Did MBS and Khashoggi had a conversation over the Phone in which MBS asked him to return to KSA, which he refused? 14: If it was a discussion why did 15 men, including intelligence agents and a forensic expert, traveled from Saudi Arabia to attend this meeting? 15: Why did Saudi Arabia say Khashoggi left, in the first place? 16: Are the men detained by Saudi Arabia actually the same men that were identified by Turkish authorities? 17: Why did it take 17 days to come up with this account? if Saudis can answer these questions, unlike their past record where they themselves investigate their crimes and blame some Fall guy and scapegoat low level officials to deflect the responsibility from Crown Prince MBS.